The second single off of the animated film Smallfoot has debuted and it’s an original song from voice cast member Zendaya. The song titled “It’s a Wonderful Life” was unveiled with a three-minute music video featuring the Smallfoot characters. The first song released from the animated film was “Finally Free” by Niall Horan. The voice cast is led by Channing Tatum (The LEGO Batman Movie, the Jump Street films) as the Yeti named Migo, and James Corden (Trolls, The Emoji Movie) as the Smallfoot, Percy. 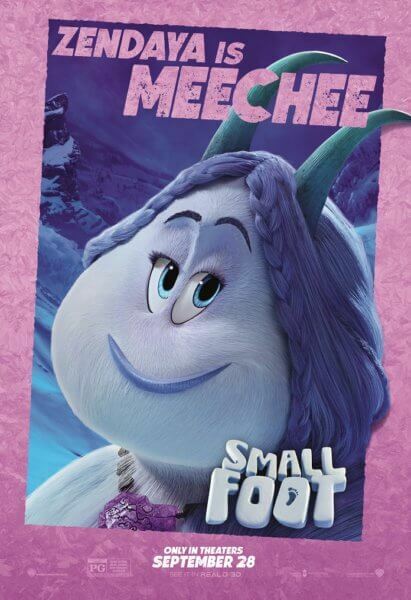 Other actors lending their voices to Smallfoot include Zendaya (Spider-Man: Homecoming, The Greatest Showman), Common (Selma, Hell on Wheels), LeBron James (upcoming Space Jam 2, Survivor’s Remorse), Gina Rodriguez (Jane the Virgin, Deepwater Horizon), Danny DeVito (The Lorax, It’s Always Sunny in Philadelphia), Yara Shahidi (black-ish, Trollhunters), Ely Henry (Justice League Action), and Jimmy Tatro (American Vandal, 22 Jump Street). Directed by Karey Kirkpatrick, director of 2009’s Imagine That and Annie Award-winner for 2006’s Over the Hedge, Smallfoot is executive produced by Nicholas Stoller, Phil Lord, Christopher Miller, Jared Stern, Sergio Pablos, and Kirkpatrick. Bonne Radford (Curious George), Glenn Ficarra (Storks, This is Us) and John Requa (Storks, This is Us) produced, Peter Ettinger is on board as editor, and Heitor Pereira is the animated film’s composer. Warner Animation Group and Warner Bros. Pictures will be releasing the family-friendly comedy Smallfoot in theaters on September 28, 2018.